According to reports, a 19-year-old Jewish Israeli man has been arrested in Israel and is being charged with making “most” of the bomb threat calls to Jewish institutions since Jan. 1. Since Jan. 1, over 100 bomb threats have been made against Jewish institutions, such as schools and community centers, around the world, including in the United States, New Zealand, and Australia. The establishment immediately insinuated that “hateful Trump supporters” were terrorizing the Jewish community. Now, it turns out a 19-year-old Jewish man living in Israel, who holds dual citizenship in America and the Middle Eastern state, stands accused of making most of the threats. The “cyberattack unit” of Israel’s fraud squad arrested the teenager March 23, it was reported in Ha’aretz, an Israeli newspaper. The arrest was based on information received from the FBI and other non-Israeli law enforcement agencies. The motives of the crime are as yet unknown, said an Israeli police spokesman. Israeli cops seized computers and other equipment the “primary suspect” allegedly used to make it hard for police to track the culprit to his lair. The suspect will remain in custody for at least the next seven days while the investigation continues. It is looking as if something like an insanity defense is contemplated. The 19-year-old was never enlisted in Israel’s usually mandatory army service because he was determined to be unfit to serve. The waves of bomb threats all turned out to be hoaxes. In “at least three” instances, bomb threats were also reportedly accompanied by destruction at Jewish cemeteries, including one in which more than 500 headstones were broken or toppled in Philadelphia. However, in one case in Brooklyn, vandals never toppled gravestones. Instead, dozens of grave stones fell due to neglect and the fact that no one was taking care of them. In a related case, a former Chicago reporter named Juan Thompson, 31, was arrested recently for his “role” in a number of bomb threats against Jewish centers. Allegedly, he did this “as part of an ongoing attempt to shame his former girlfriend,” Ha’aretz reported. It is not known at this time whether the two suspects are linked in some way other than coincidence. Thompson was charged with making at least eight threats against Jewish institutions in the United States, and a bomb threat to New York’s so-called Anti-Defamation League. 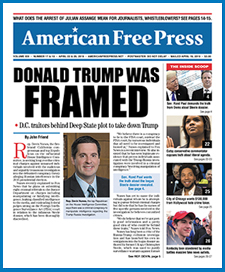 John Tiffany writes exclusively for AMERICAN FREE PRESS. the Zionist Jew thrives on others confusion. The so called failed states of Libya, Iraq, Afghanistan, Yemen, the wars in Ukraine and Syria are music to Nuttyahoo, and Isaeli ears. Control of media, money, education, publishing, politics, and policy in most western countries is absurd, but makes it easy work for them to do. After all goyim are like cattle born to serve them. Their words not mine. If we can over turn the Federal Reserve Act effectively ending borrowing at interest what is ours, we will be free. Simple solution, hard to effect, but so worth it. Let’s get rid of the yoke. Oh yes, one Misguided Israeli Youth from Tel Aviv with Dual Citizenship. Never mind What Else Goes On. Absolutely Nothing happens that is unknown at this point. This means if we hear about an unknown hacker, a missing child, an unsolved terrorist crime, an unknown illness…more than likely-that this is the Hallmark Brand Of Disinformation, a False Flag, or a Psy-Op. You can bet your Franken Shekels that virtually Nothing happens without the Blessing of The Chosen & Inhuman Element…did you really think there were Accidents at this point? Apparently I also better not try that kind of irony here. Pat Kittle thinks that “The World” is not doing enough to protect “Its Jews” The world is not doing enough to protect its English/Germans, like me, either but you don’t hear me whining about it. This is just a staged event by the Zionists to make it appear that Trump is not a puppet of Israel and the Zionists. Sorry all you Trumpsters, Donald J Trump is a stooge and puppet of the Zionist state of Israel. My God! I cannot believe the last comment that the world is not doing enough to protect Jews. WHEN WILL PEOPLE GET IT INTO THEIR HEADS THAT THE JEWS WORLDWIDE ARE ONLY THREATENED BY THE BEHAVIOUR OF THE ASHKENAZI EASTERN EUROPEAN JEWISH CABAL THAT HAS RULED SINCE 1948. World Jewry and the Palestinians are the victims. SORRY! but until all good Jews everywhere realise that their beloved Israel is an Apartheid regime and stand up and be counted, their predicament will continue. That’s false. Just the opposite. The USA is not doing enough to stop Israel from its continued oppression (murder, land grabs) of the Palestinians and to disable once and for all the Likudist- Zionist program of dragging the USA into more wars on its behalf in the Mideast (with Iran next in their sights). False flags are always helpful to enlist sympathy, such as the big one of the WTC attack carried out by the Mossad in collusion with neo-con traitors inside the US government. The Mossad was originally created to terrorize the Jews in Iraq into fleeing to Israel – way back in the 1950s. I read this in a book titled “Israel’s Secrete Wars” which was written by Benny Morris and Ian back, and it was officially approved by the Mossad itself. As arry Goldwater said, “Behind most of the trouble in the middle east you will find the hand of Israel.” Same holds true for acts of “Antisemitism”. If it is horrendous, such as pushing the old cripple Klinghoffer overboard, ti is most likely Israel that did it. What, is the world supposed to protect “its Jews” from themselves? Who is going to protect the world from the Jews who are the synagogue of Satan? why is this classified as insanity instead of terrorism? If it was a Muslim who did the same thing, it would BE TERRORISM… DOUBLE STANDARD is par for the course..
Pat – don’t try that kind of irony in any MSM publication! You will be deluged with Zio duped zombies saying that you are absolutely correct! Talk about your persecution complex. Regardless of who’s making terrorist threats against Jews, this is yet another example of how the world is not doing nearly enough to protect its Jews.